Collections have been made from every house in the parish of Woolsery towards sports prizes and tea for the children and a tea for the senior citizens to commemorate the Queen's silver jubilee. Richard Dunn, 6 Sunnyside, Woolsery, was seen carrying in a goods vehicle a load of logs on the Hartland to Clovelly Cross road but not displaying a carrier's licence. Asked what he was doing with the logs, Dunn was said to have told a police officer that he was delivering them to Hartland, and when told about the need for a 'C' licence, replied "I have got one at home." Since their school pool was opened in June, 17 children of Woolsery county primary school have learned to swim and have gained beginners' certificates. 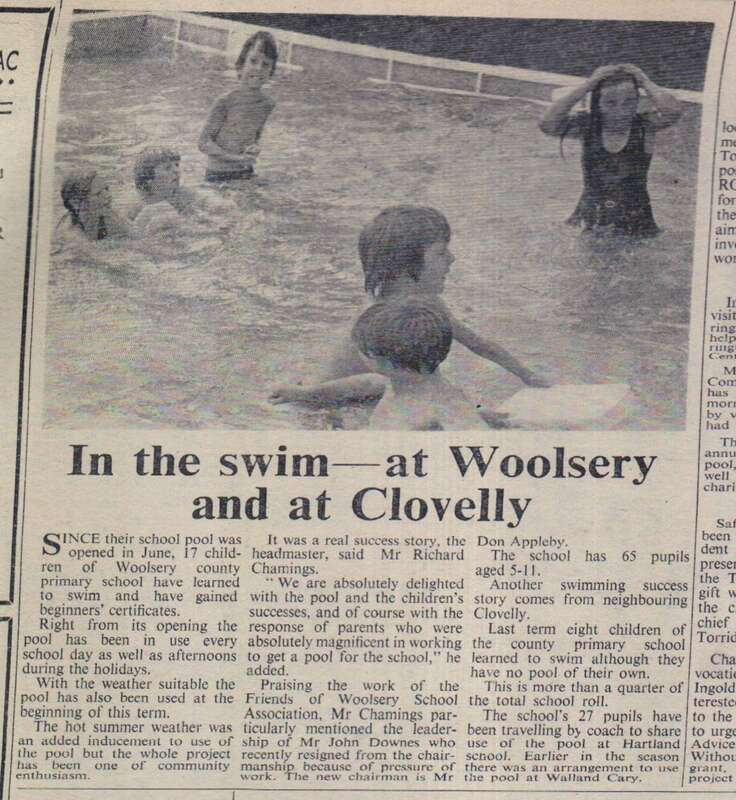 Right from its opening the pool has been in use every school day as well as afternoons during the holidays. With the weather suitable the pool has also been used at the beginning of this term.The hot summer weather was an added inducement to use the pool but the whole project has been one of community enthusiasm. 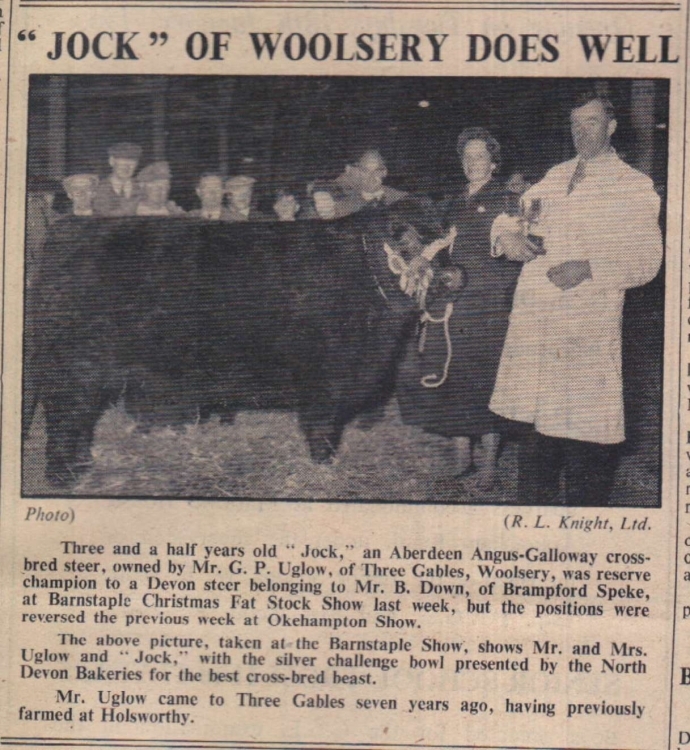 Three and a half years old 'Jock' an Aberden Angus-Galloway cross-bred steer, owned by Mr G P Uglow, of Three Gables, Woolsery, was reserve champion to a Devon steer belonging to Mr B Down of Brampford Speke, at Barnstaple Christmas Fat Stock Show last week, but the positions wer reversed the previous week at Okehampton Show. The above picture taken at the Barnstaple Show, shows Mr and Mrs Uglow and 'Jock' with the silver challenge bowl presented by the North Devon Bakeries for the best cross-bred beast. Among some 170 people attending the annual hunt ball in Woolsery Parish Hall were the Master of the Stevenstone Hunt, Mr J Down, and his sister, Miss Down. 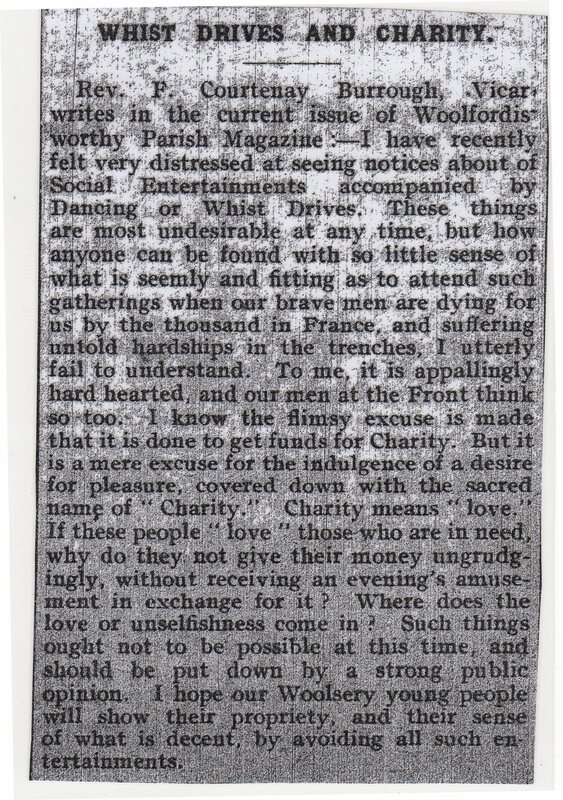 The event was organised to help swell the Hunt funds by a committee consisting of Messrs J Andrew, W Harding, G Lott, I Harding, A Burrow, A Souch, C Jennings, A Westaway, L Symons, C Yeo, C Johns, H Allin, K Allin and P Chapple. 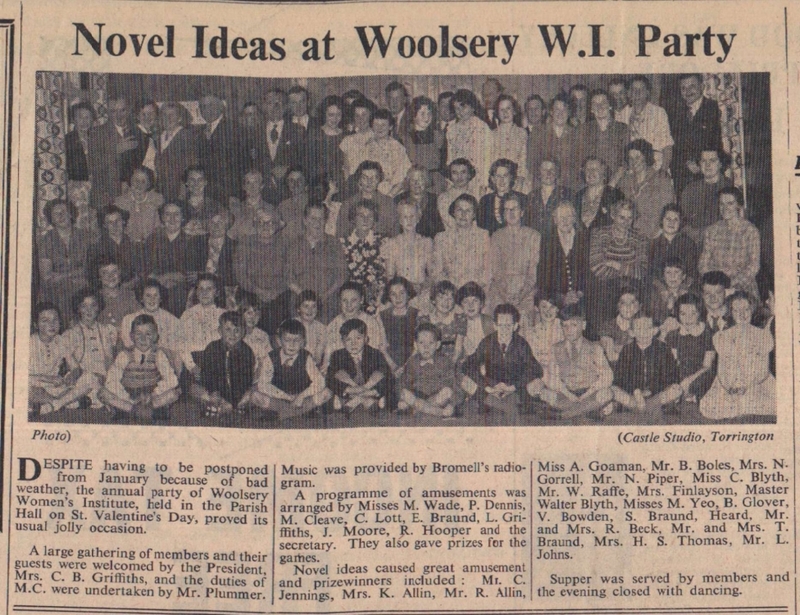 Despite having to be postponed from January because of bad weather, the annual party of Woolsery Women’s Institute, held in the Parish Hall on St Valentine’s Day, proved its usual jolly occasion. A large gathering of members and their guests were welcomed by the President, Mrs C B Griffiths, and the duties of MC were undertaken by Mr Plummer. Music was provided by Bromell’s radiogram. A programme of amusements was arranged by Misses M Wade, P Dennis, M Cleave, C Lott, E Braund, L Griffiths, J Moore, R Hooper and the secretary. They also gave prizes for the games. Two names were suggested to Bideford Rural Council for a proposed new estate at Woolsery. “Perkin’s Field” was the suggestion of the developers, who plan to begin the operations shortly. “Manor Park” was the choice of local councillors Mr R J Stoneman and Mr C J Andrew. “Manor Park” was chosen by the council. Six grandsons were bearers at the funeral at Woolsery Parish Church on Wednesday of last week of Mrs Emily Wonnacott, widow of Mr Richard Wonnacott, of Huddisford Moor, Woolsery. She was 75. The Vicar, Rev P F H How, conducted the funeral service and the organist was Mrs H S Thomas. At Woolsery Methodist Church, the Sunday School anniversary services have been held. The preacher on the Sunday was Mr I Quance, of Sutcombe, and the scholars took an active part in the services. On the Monday the tea was well patronised, pourers and helpers being: Mrs W Hill, Miss Johns, Mrs A Bray, Miss P Dennis, Mrs J Wonnacott, Mrs T Eastabrook, Mrs S Wonnacott, Mrs W Walter, Mrs A Dennis and Mrs B Wonnacott. Tea steward was Mr S Wonnacott (Superintendent). 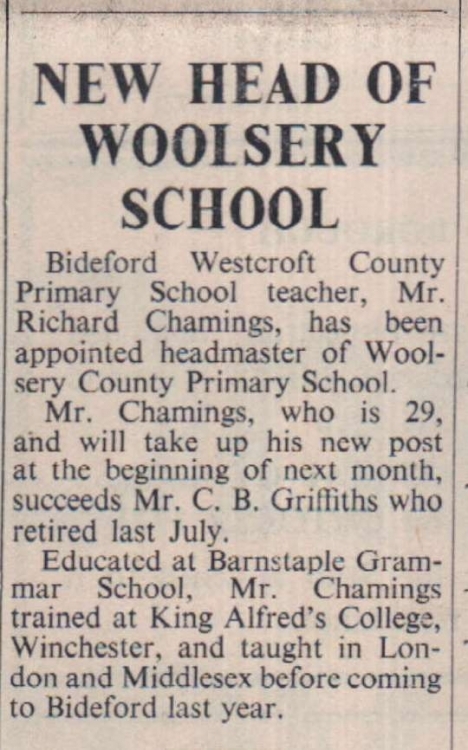 Bideford Westcroft County Primary School teacher, Mr Richard Chamings, has been appointed headmaster of Woolsery County Primary School. Mr Chamings, who is 29, and will take up his new post at the beginning of next month, succeeds Mr C B Griffiths who retired last July. Educated at Barnstaple Grammar School, Mr Chamings trained at King Alfred's College, Winchester, and taught in London and Middlesex before coming to Bideford last year.